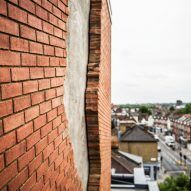 British artist Alex Chinneck has unveiled his first permanent public installation – a 10-tonne ripped page made from 4,000 bricks. 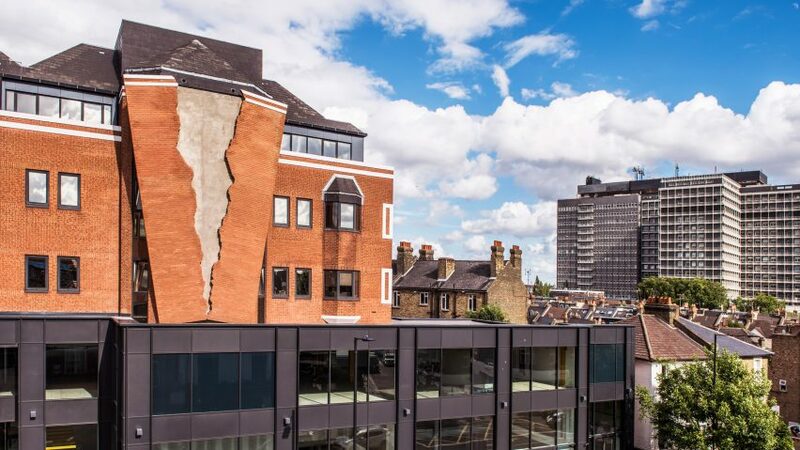 Titled Six Pins and a Half Dozen Needles, the artwork has been installed on the site of Assembly London – a campus of offices, retail units and restaurants situated in Hammersmith. The area had been home to a publisher for two decades, and Chinneck has referenced its history in his piece. 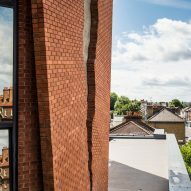 Placed 20-metres high, the sculpture has been designed to appear as if part of the building's existing red-brick facade has cracked in two. Chinneck spent months scanning torn sheets of paper to digitally design the split, which is intended to resemble a page ripped from a book. "I try to introduce sculptural interventions in unexpected contexts, heightening a sense of discovery when you encounter them," he told Dezeen. "With this in mind, the archetypal nature of the building's upper elevation makes it a perfect platform for surprise." 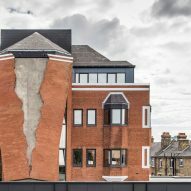 "The work looks to energise the architecture by reconfiguring and reinvigorating what was already materially present, albeit seemingly," added Chinneck, whose previous sculptures include a huge upside down pylon and a Christmas tree trapped in a giant ice cube. "Given the size of the sculpture I've also tried to restrain it from becoming contextually overpowering by making it visually harmonious with the situation it occupies," he added. 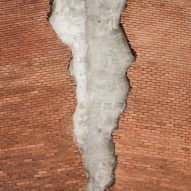 The two parts of the 12-metre-high sculpture lean away from the building, as if about to fall down. 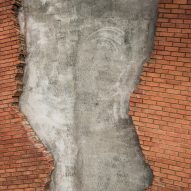 Chinneck set the artwork just two layers of bricks deep, to lend the piece a "cartoon-like quality". 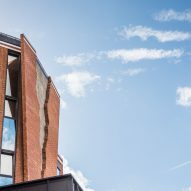 The artist collaborated with a diverse team over the course of 14 months to complete the piece, working with structural engineers, brick makers, water cutters, steel fabricators, site welders, crane operators and tilers. The sculpture is placed on a steel framework that's bolted and welded to the building, and its rip is made from 1,000 separate stainless steel components and hundreds of unique bricks – each individually cut by hand and water. Installation took 18 hours, and each section had to be lifted 75 metres up to clear the site's neighbouring buildings. Chinneck has named the piece to reference the pins and needles used to stitch up a tear, and also its two divided sections. "I arrived at 'Six Pins and Half a Dozen Needles' by divorcing two things that are inherently linked, placing pins and needs on opposing sides," he explained. "I use well-known expressions because I think people feel an immediate acquaintance with them. Surrealism is the warping of the world around us and both my work and my titles look to distort familiarity with a measured portion of fantasy." 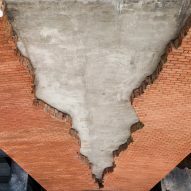 Chinneck's work often blurs the boundaries between architecture and sculpture, and temporary installations by the artist have appeared across the UK – including a building turned upside down in Hackney and a slumping house facade in Margate. 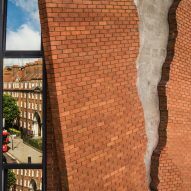 The 33-year-old graduated from the Chelsea College of Art in 2007, and has spent the last ten years gradually drawing increased attention for his work – which has been featured in press around the world and attracted hundreds of thousands of visitors. He is one of the youngest members of the Royal British Society of Sculptors.